At 78, Russell Jim is at the age when most people are slowing down. But this elder of the Yakama Nation in Washington State remains full of righteous anger about the way his people have been treated over the last 150 years. "The real history of Native Americans has not been told yet," says the silver-braided Jim. "When the US government put our people on reservations, they put us on the worst lands where there are few resources." Especially galling to Jim, who is the project director for Environmental Restoration and Waste Management Program for the Yakama Nation, is the government's mishandling of the nuclear waste at the Hanford Nuclear Site, which lies just 20 miles from the Yakama Reservation. "We [the tribes] tried to get on the list for compensation," says Jim, who has suffered from throat cancer. "Personally, I am convinced that much of the illnesses, thyroid problems and cancers are from Hanford." Jim also worries about birth defects in the tribe, as three counties around the reservation have been seeing high rates of anencephaly, a rare and fatal birth defect. "We asked two doctors yesterday [May 15] about how the tribes are affected. They said they don't know yet, and we don't know yet either. But we do know that radionuclides can damage our and the salmon's DNA." The Hanford Nuclear Site in central Washington State was a centerpiece of the United States' early nuclear weapons program, the first plutonium production reactor in the world. Between 1944 and 1972, radioactive materials from the reactor were routinely flushed directly into the Columbia River or dumped onto the ground -- as much as 1.7 trillion gallons of liquid waste, radionuclides and hazardous chemicals. Though many releases had short half-lives, health experts say they posed health risks due to the high amounts, especially for the tribal people who depended on fish from the river. Most of the reactors were decommissioned in the 1970s, but the site was left with massive amounts of nuclear waste. As measured by volume, the site has two-thirds of the US' high-level radioactive waste. Today, it is the focus of the largest environmental cleanup effort in the US. For the Yakama Tribe, the radioactive leaks from the Hanford Site marked just one of a series of injustices. In the 1930's the federal government began building a series of hydropower projects on the Columbia, including the famous Grand Coulee Dam, which choked off the once prolific salmon migrations. Then the government confiscated the Yakama's sacred spiritual places and ancient fishing and hunting grounds along the Columbia River to create the nuclear weapons production site. 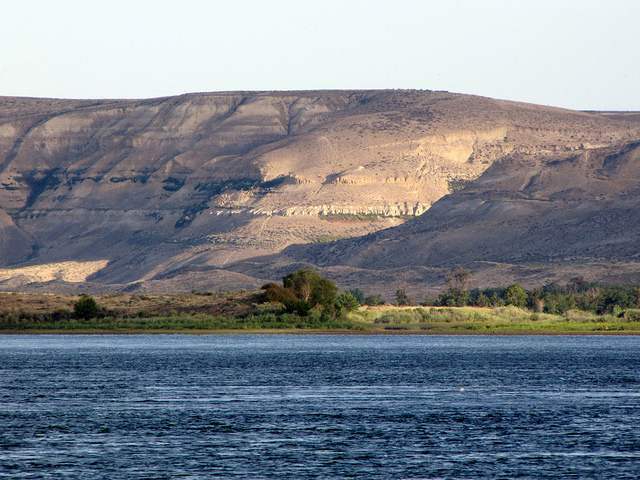 Although tribe members living along the Columbia received compensation for the loss of their homes due to the dams, this did not cover the loss of their livelihoods and fishing rights, including at Hanford. According to the Yakama Treaty of 1855 they are promised access to their "usual and accustomed places" for hunting, gathering, and fishing. "This is important," Jim explains, pointing to the map of the territory the Yakama lived on before it was taken by force. "Because the land we have is not enough to meet the diet we are genetically adapted for." That is, a diet that doesn't include the cheap starches foisted on the tribes, and for which Jim blames the high rates of diabetes and other health problems. Recently the river corridor near the nuclear reservation, known as "Hanford Reach," has seen the largest spawning population wild fall Chinook salmon in recent memory. The tribes are guaranteed special access to the salmon, which they make use of. But many people wonder if the fish is OK to eat, given the radioactive materials buried near there. "I've asked: 'So it safe to go back there?'" Jim says. "They say, 'We don't know,' and they can't tell us as they are under contract to the DOE [Department of Energy] and bound to confidentiality. . . . We don't have enough funding to conduct the needed testing on young salmon, to see how it affects them." The high-level radioactive waste at Hanford still has no permanent disposal site. There was an effort, before the Nuclear Waste Policy Act passed in 1982, to turn Hanford into a storage site for nuclear waste from around the country, but the Yakama Nation blocked it. "Stopping waste storage at Hanford was a very major success for us," Jim says. "They were going to drill down 3,000 feet under the water table into the basalt formation. [After the act passed] they started drilling up to 150 feet. We filed at injunction to stop them. They tried to say it was already grandfathered in." The Umatilla and Nez Perce, two other federally recognized tribes, later joined the effort and successfully filed for affected tribe status. While Washington State and the Yakama Nation want the waste moved, previously promised by the Department of Energy by 1998, long-term nuclear storage options remain elusive. Federal agencies spent countless hours and billions of dollars laying plans for a permanent nuclear waste deposit facility at Yucca Mountain in Nevada, but then President Obama scrapped that option. Temporary storage sites are also in flux. The Skull Valley Goshute Reservation in western Utah was to host a nuclear waste storage site, but that plan, too, collapsed in late 2012. The Waste Isolation Pilot Plant (WIPP) facility in New Mexico is the only permanent nuclear waste repository in the US today, but it is only designed to store low level waste, such as soil, clothes and tools contaminated with plutonium. Its future hangs in the balance after a brief closure in February due to a radiation leak. Tom Carpenter of the watchdog group Hanford Challenge says "the current company doing the cleanup is doing a bad job. They seem to be more interested in the contractor fee and money." His organization has worked with whistleblowers to increase public awareness and bring media attention to the many problems. "Hanford has turned into a giant feeding frenzy for contractors," he says. According to Carpenter, six of the 177 massive underground tanks at Hanford have been leaking. Carpenter says: "They say don't have room to store it [the radioactive waste] in the existing tanks. They say the outer tank is still good. We say they need new tanks. They are just going to let it drift into the soil." The contractors say building new tanks will require more money. "In the 1980's a tank cost $10 million, but now they claim it is $150 million per tank. We want to know how it is possible that the cost went up so much. It cost a lot less in 1980, why is it so much more now?" asks Carpenter. The waste that was poured into the soil and, later, leaked from containment units, now manifests itself as toxic groundwater plumes flowing toward the Columbia. These plumes are at varying distances from the Columbia River, but some are as close as 400 yards from the river. Russell Jim says about 150 "upwellings" of groundwater from the site enter the Columbia River depending on its level, in areas where juvenile salmon like to gather. In February, divers at Wanapum Dam upstream from Hanford discovered a 65-foot wide crack in the dam. Water has been drawn down from the reservoir to take stress off it but this inundated the shores of the Reach where the upwellings occur, merging the Columbia River with contaminated Hanford water. In the meantime, the game of cat and mouse continues at Hanford. "They seem to be using a 'hide and hope' strategy to deal with this," Carpenter says. "A lot of environmental organizations have stepped away." However, the Yakama remain resolute. "We are not able to pick up and move on," Russell Jim says. "This is our home -- the Columbia River." Michelle Tolson has an MSc in community development from the London School of Economics and Political Science. She has worked on research projects in New York City and Cambodia. As an international correspondent, she has written from the Asia Pacific and U.S. for publications such as Inter Press Service, The Diplomat, and RH Reality Check.